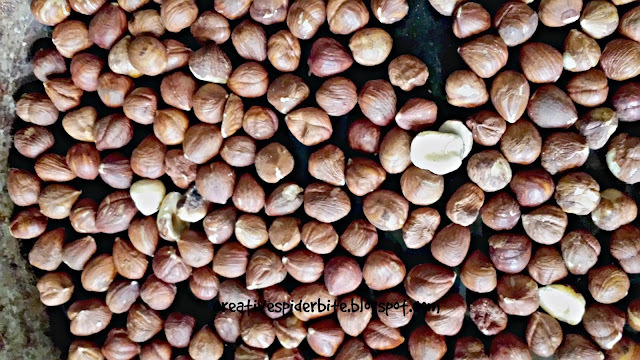 You might be wondering why adding this extra step of roasting the hazelnuts before making your own nut milk is worth your time. Well, let me give you two good reasons. 2) roasting hazelnuts helps remove the brown skin around the nuts. This skin is responsible for any bitter taste in the nut milk. So, now you see why these additional 5 minutes of work are really worth it. Pour your 200 grams of Hazelnuts into your frying pan NO! additional oil. This works fine in my cast iron pan. I have not so good experiences with my ceramic pan! 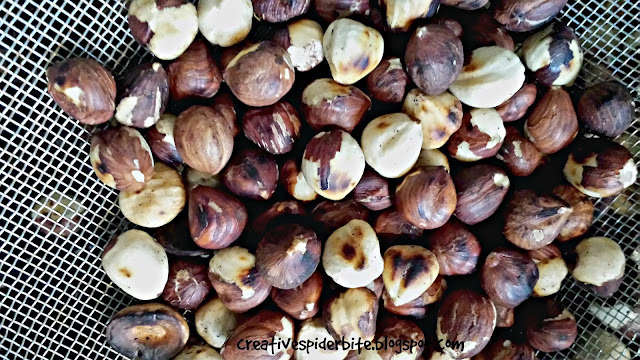 Next, pour your toasted nuts into a sieve and keep rubbing them with a spoon against the mesh to get the remaining skins off. The very stubborn ones you can rub between your hands and fingers. At this point the roasted nuts should have cooled down enough that you don´t get burned. But be careful anyway. Thanks to the oils in the nuts your hands will feel really smooth! And don't worry about the discolouration on your skin, it is nothing a bit of soap and water won't fix! 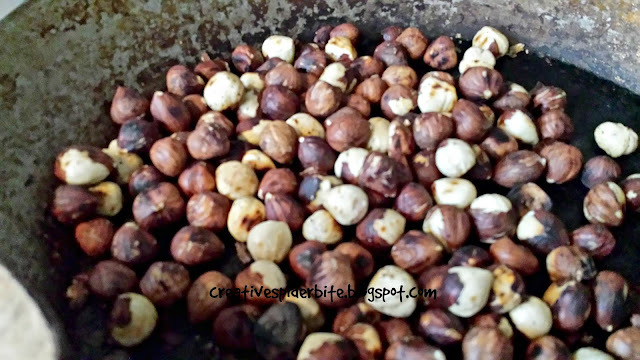 Now, put the nuts into a little bowl, cover the hazelnuts with water and leave them soaking in a covered bowl in your fridge for 12-24h. and add 4 cups of water. After making sure you closed that lid properly you turn on your machine and let it pulse for a good 10 minutes. You need to do this, for this long to release the oils within the nuts into your milk. Hazelnuts are very rich in vitamins E, but it is bound in the oils. So if you want to get all the goodness into your milk you need the oils! Now for the next step, Pinterest is full of tips and tricks to make your life easier. Let me warn you the one with the french press does NOT work! At least not with my bodum. Maybe the good ones have a mesh that is too fine? The nut pulp plugged the mesh and I couldn't get down more than 1 cm. More force and I would have feared to break my french press. So here is what I do. 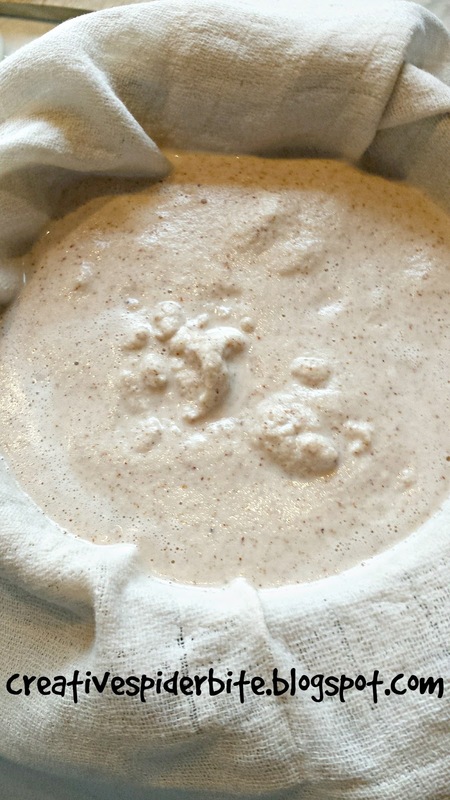 I take a burp cloth (I use them instead of cheese cloth as they are washable and reusable) line a jug with the burp cloth and pour the content of your pulsed water hazelnut mix into it. Get a rubber band and hang it up and drain all the yumminess out of the mix. Now fill your roasted hazelnut milk into a clean bottle and refrigerate. It will last for about 4-5 days. This is the only nut milk I can drink straight from the bottle. 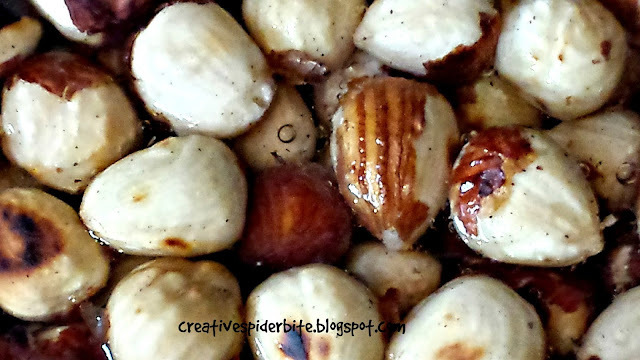 But I also love using it in Smoothies, baking (Hazelnut Carrot Bread) or in my coffee. The cheetah was wondering why I was laughing so hard.....can you use the milk as a coffee creamer? OMG! You have me cracking up here, I will never read that line straight faced again! And yes it makes a great coffee creamer, adds a lovely taste to it. Thank you Chrissy! I hope You will enjoy it as much as we did. This looks lovely! I'm not much of a cook, but would be willing to have a go making this. Love Jinzo's comment too haha! Thank you! And yes Jinzo cracked me up, too!